Just FYI, there's a nice little place downtown that has good food, and maybe isn't as busy as it should be yet. 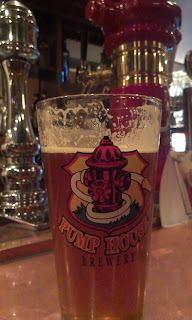 Water Street Fish & Chips in downtown Charlottetown has been bringing in Pump House brews on tap for a couple or few months now. This week, they've got the S.O.B. and IPA on tap (next time I'm in, I'll ask what others they still have on with them). I snuck in for a quick IPA last night, and I must say it was a pretty nice beer. Good aroma, nice & bitter. Lots of citrus & pith. I feel I must also note that the pricing's great, too - only $5.41 before tax or $6.25 after tax... something along those lines. Good luck finding a decent craft brew in town of a similar size for the same price. It's also worthy noting that, as of now, these are the only craft brews available on PEI other than the Gahan / PEI Brewing Co. offerings. Next week, Water Street has a burger entry in the PEI Burger Love competition, so I expect I'll be down for a burger and a pint or two some day! Pumphouse pumps out a quality product. Good to see them on the Island. They have the lager on tap too. IPA keg is still tasting mighty fresh. Best (non-home-brewed) draught beer I've had on PEI in a long time! AND... I also learned today that The Old Triangle has the lager as well (and your hubby thought they had/have the blueberry ale, too). I wonder how many places have PH ales that I wasn't aware of!